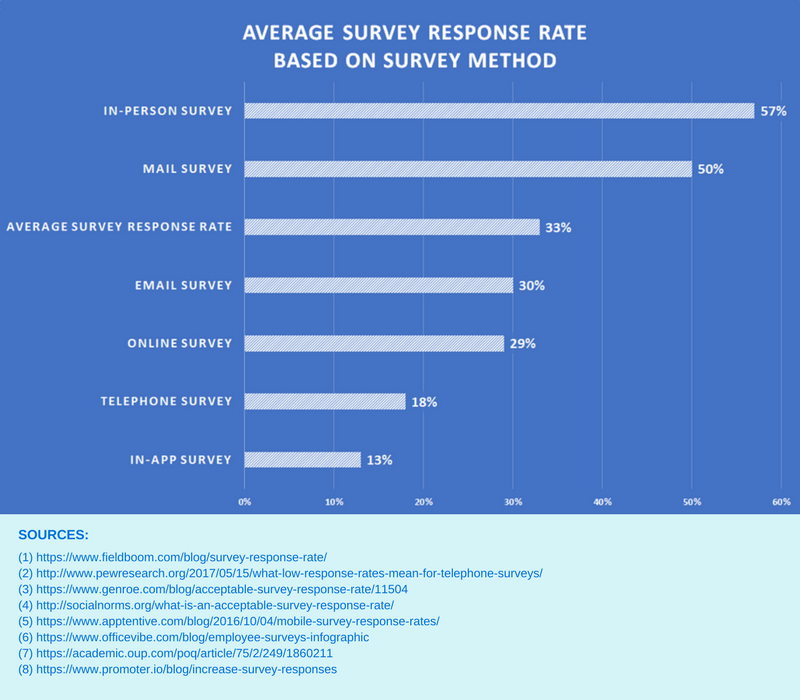 What is the average survey response rate? The long answer is a bit more nuanced though. Since there is no agreed-upon minimum acceptable response rate, it will largely depend on how you go about creating, distributing, and collecting your survey. Nevertheless, over the years a lot of studies have been done on what the average response rate of a survey should be and which parameters have an influence on it. We’ve combined all this information into one infographic containing the most recent data. But before we dive into the numbers, it’s important to have a clear understanding of what exactly the response rate is. What is survey response rate? In survey research, the survey response rate is the number of people who answered the survey divided by the number of people you sent the survey to (the sample), then multiply that number by 100, since it is usually expressed in the form of a percentage. How do you calculate the response rate? Seems pretty straightforward, doesn’t it? So, why is the response rate so important? A low response rate can give rise to sampling bias if the nonresponse is unequal among the participants regarding the outcome. If you select a sample of 1000 managers in a field and ask them about their workload, the managers with a high workload may not answer the survey because they do not have enough time to answer it, and/or those with a low workload may decline to respond out of fear that their supervisors or colleagues will perceive them as surplus employees. A survey’s response rate has always been viewed as an important indicator of survey quality. However, recent studies have shown that surveys with lower response rates (near 20%) had more accurate measurements compared to surveys with higher response rates (near 60 or 70%). Nevertheless, in spite of these recent research studies, a higher response rate is preferable because the missing data is not random. A high response rate (>80%) from a small, random sample is preferable to a low response rate from a large sample. Now we’ve got that out of the way, it’s time to move on to the main course of this article. In this infographic, you can find the average survey response rates for the most used survey methods based on the most recent data. The most effective survey method is still the in-person survey with 57%. In-person surveys can be held at the moment when the survey is most relevant and allows for the most personalized experience. The mail survey comes second with 50%. As people are living in an increasing digitalized world, receiving an invitation via real post gives a more premium experience. The downside of this survey method is the higher price. Third on the list is the email survey, with an average response rate of 30%. People are receiving more spam emails every day and, unfortunately, spam filters are extremely hard on the word survey. TIP: Don’t use the word survey in your email subject line to increase your survey response rate by 10%. Check out our 34 other tips to improve your survey response rate. Another trick is to add your survey to a confirmation or after service/purchase email, this guarantees your survey is sent out at a relevant timing. Next, we have the web or online survey. As mentioned earlier it is often hard to get an accurate view on the survey invitations needed to accurately calculate the survey response rate. Second to last we have the phone survey. The response rate for telephone survey has been declining the past 2 decades. And this trend is not changing anytime soon. Still, studies have shown that despite low response rates, telephone surveys are able to produce accurate results. Finally, there’s the in-app survey. This is a rather new survey method and there’s not a lot of data published on this topic. Similar to the online survey it is proven difficult to get an accurate definition of who is invited to the survey and who is not. When we accumulate all this data into one number, we find an average survey response rate of 33%. Internal surveys (employees) receive a 20% higher response rate compared to external surveys (customers or users). Survey response rate is directly correlated to survey length or duration, we’ve seen on average a 17% drop in response rate when a survey has more than 12 questions or takes longer than 5 minutes to complete. A reminder to complete your survey between 3 to 7 days after the invitation will boost response rate by up to 14% with just a single reminder. If you’re concerned people will get upset for sending them a reminder survey, we’ve found that only a 0.5% will actually unsubscribe. The B2C response rate is on average 12% lower than the B2B survey response rate. Before you make up any kind of survey, you have to know what you want to achieve. It’s very important to have a clear goal in mind. Once you have this figured it will be a lot easier to convince people to take your survey. The survey has to look appealing and should ideally attract the attention of your target audience, both in style as in language. You need to make sure everything is clear, easy to read and to fill in. Most survey makers on the market provide ready-to-use survey templates, so you don’t have to start from scratch when it comes to designing the survey and crafting the questions. For online surveys, it’s important to make your survey responsive and you should limit the number of clicks needed to complete the survey. Try to personalize the survey as well. Dirk Heerwegh’s 2005 study into personalized invites for online surveys (e.g. ‘Dear John’ as opposed to ‘Dear Customer’) concluded that personalized survey invites increased response rates by 7.8%. In addition, respondents that received these invites were 2.6% less likely to drop off before completing all survey questions. I’ve already mentioned the importance of language: Try to get into the mindset of your customer and make questions based on that. Or follow our tips to sound more human in your survey. Make sure you use a variety of question types such as multiple choice, rating, Likert scale, etc. Each question type has its strengths. People get distracted very fast, so you should only ask questions you NEED to know. As mentioned before having a survey with more than 12 questions or that takes longer than 5 minutes to complete see a 15% drop in response rate. The drop is even bigger (up to 40%) when a survey takes longer than 10 minutes to complete. Tell your respondents how long it will take to complete the survey before they start. And make sure you don’t exceed that timeframe. A common mistake is sending the same survey to different audiences and expecting the same response rate. When you’re aiming at a B2C audience, you can expect a response rate that’s 12% lower than a B2B audience. Creating an internal survey will have a 20% higher response rate compared to an external survey. People don’t like to do stuff for free anymore. They need some motivation or incentive to get them going. Studies have shown that having an incentive can increase your response with 10 to 15% depending on the quality and attractiveness of the incentive to your target audience. The consensus amongst many research experts is that ‘useful, relevant information’ is the most effective form of incentive to business audiences. For example, the information they provide you will help you improve certain aspects of your products or services – in turn resulting in a better experience for your customers. This is called an intrinsic reward. It’s better to focus on informing respondents about the intrinsic rewards of completing a survey as respondents will understand that it’s in their best interest to answer the survey questions as honestly and completely as possible. You might also decide to offer extrinsic rewards, such as coupons, discounts, and other deals, to customers who take the time to respond to your survey. Needless to say, this might make some customers more likely to complete the survey, the downside to providing extrinsic rewards is that some individuals might complete the survey just to receive their reward. Those who approach the survey with this mindset may or may not actually take the process seriously, meaning you might end up with a bunch of invalid or otherwise unusable responses. You can avoid such instances by providing an incentive that, while extrinsic in nature, isn’t of any extreme value. This statement is also supported by a study conducted by e-Rewards Market Research, two random sample selections utilized: 4,000 people were invited to complete the survey for entry into a sweepstake drawing of $2,500, and another 4,000 people were invited to complete the survey for $2.00 in cash. Both groups launched and closed on the same day of the week and the same time of the day. It was a one-minute survey about books and music. 19.3% for $2 cash ‘pay all’ sample. 12.2% for $2500 sweepstake sample. This proves that people prefer to complete a survey when they are certain they’ll receive something instead of the slim chance of winning a big prize. For in-person or phone surveys it is pretty straightforward to define who is invited to take the survey: How many people did you ask or call to participate? For email surveys, it gets a bit trickier. Do you count all the emails you sent out? With or without bounced emails? Or do you count only those who opened the email? Depending on which one you take you can significantly inflate your response rate. When you use a web survey, it gets even harder. It is difficult to define the number of invitations for an embedded survey on a webpage since a web visitor is only presented the survey, but technically not invited. Counting everyone who visited this page as invited can lead to very low response rates. So what can you do in this case? You could calculate the survey completion rate instead of the survey response rate. What is survey completion rate? The survey completion rate is calculated by dividing the number of surveys filled out with the number of surveys started by respondents. So only those respondents who entered and completed the survey will be included in this statistic. How do you calculate the completion rate? Especially for web or online survey, this is a better indicator of your survey’s performance as it can be easily measured. These response rate numbers will give you an indication whether or not your survey is performing out of the ordinary. But the averages within your country or industry can still vary greatly. The best benchmark you can have is yourself. Use the data and response rates from previous surveys as an indication of whether any adjustments or improvements should be made. Hi Lynsey,Thank you for your reaction. Unfortunately, we don't have any data about that. Don't settle for average! Use a survey tool that gets your questions answered! Build smart surveys that skip irrelevant questions and return only what applies to the respondent.